I am attempting to add a secondary deep cycle AGM battery inside my van to use for power. So far what I have learned is that hooking the terminals directly to the terminals of the battery in my van would charge my small battery too quickly. Does anyone have any advice or info on some sort of resistor I could purchase so I could charge my small second battery? If you're adding a second battery, it's best to have it match the one already in the vehicle. Even then it's better to buy 2 batteries at the same time from the same production run. The reason, If they're not matched one will always be weaker than the other which affects the charging cycle from the alternator. The alternator will detect a full charge on the best battery and stop charging. When the car is off, the good battery will feed the other battery (balancing) and because they don't get or stay 100% charged, it will shoten the life of both batteries. If you do this, buy two identical new batteries. My RV has a deep cycle extra battery for running fridge, lights, etc., seems like it's connected to some kind of regulator. The right way to do it is to install a modern house battery isolator. Now, the problem with that is they cost some $$ and are designed for rather large banks of batteries, not the tiny little thing you are using. You could custom tinker with a dc-dc converter but then again it will likely cost more than the battery. Get a bigger house battery and a cheap solenoid isolator. Get a 20W solar panel and diode and keep the house battery separate from alternator. Just get a solar panel and a charge controller. This method would let you charge the second battery without starting the engine. You can usually pick up 50W semi flex marine panels for $100 or less and a cheap 10A charge controller for $20. If this if for the burn or camping in general, I'd suggest having water resistant hookups on the outside of the van and MC4 extension cables. That way you can park the van under shade and setup the panel in the sun. You can certainly use a current limiting resistor but you need a high-watt resistor and there will be some trial and error to get it to 2A. Plus that resistor will drop the voltage some on the small battery so you may not get effective charging to capacity. We have many people here experienced in solar, generators, and energy systems on the playa, a wilderness, not the virtual ePlaya. Many people simplify batteries, but in real life they are an analog thing. A dedicated charger responds to their analog needs. They want certain charging current varying minute by minute depending on how filled they are measured by the voltage they are showing sensed by the (smart) charger. A car charging system is not smart enough to sense and respond minute by minute to two different batteries. The ideal setup would be a car to inverter to battery charger to your battery. But then the super ideal setup would be solar to solar controller to battery. AGM are not the cheapest, so treating them analog-well has value. But then again a separate charging system is not free. To the specific question, consider a 2-4 Amp charger that works off 120V AC fed by an inverter off your car DC system. The real playa is a vast experiment including energy self sufficiency. Welcome and maybe use at home for emergency preparedness year around. I think you might also be able to charge both batteries at the same time if you have a battery isolator. For regulating current, if you're up to it, you can use a voltage regulator and build a circuit that will regulate to ~2A. There will be a voltage drop across the circuit, and it will generate heat (and use energy) while it is regulating current. You may want to heatsink it. I don't know the regulating voltage will be too high for the alternator voltage (14.5V?) to charge the battery sufficiently. Here's one example voltage regulator (LD1085). It is rated for 3A max, and is adjustable, which is needed for the circuit. Here is a current regulation circuit. It uses a different voltage regulator (LM317), but it's the same setup (VRef is the same at 1.25V). Pretty much all these ideas aren't as simple or cost effective as just getting a bigger battery and hooking it up like normal, either through an isolator or a solenoid. Plus, car-battery sized deep cycles are usually in the 100 ah area. The one you have is tiny. Why bother going to any trouble and expense for it. Is my reading comprehension faulty? I understood the OP to mean he wanted to add an extra battery to his vehicle. Thought my way was the easiest, though sticking an isolator switch is a good addition. The way I understood the question was he wants to add a "house" battery, to run camp-type things independently of the starting battery. Most of the time is spent in the "bulk" phase. In that phase the charger acts as a "constant current source." But if you put too much current through the battery will overheat. In the last phase, the float phase, the charger acts as a "constant voltage source," delivering minimal current to keep the battery topped off. As mentioned by Mr Figjam above, you can parallel and series batteries on a charger if they are close to identical. That is because each battery is going to have different curves shown in the article. 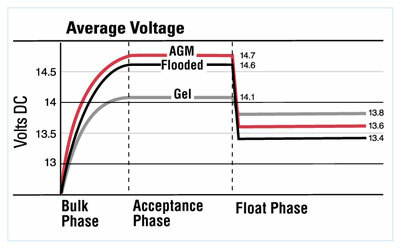 There is a difference between AGM and most car batteries which are flooded. And gel cells are more different. The charger would like to know what it is connected to to do the right thing. My philosophy is to repurpose as much of my burner things throughout the year. So it may be possible you can justify a matched charger for batteries used for camping or household emergencies. So how the heck does the alternator in my truck charge my two batteries? Does it have one of these diagrams burned into some kind of controller? For that matter, how in the world did car batteries survive in the 60s before we had fancy PWM and MTTP? I’m sensing we may be overthinking the situation. My truck is almost 20 years old and even it has temperature sensors under each of its two batteries and the truck's ECM controls the charge rate from the alternator... they do get a bit fancy. But yeah, it doesn't have to be such a big deal. None of my older trucks had that and I always had two batteries. My Mutant Vehicle has two deep cycles and I just run 'em directly in parallel. There's a separate alternator for the starting battery, but when it's running I have a solenoid that just parallels all of everything. It works fine.